Seoul, the capital of South Korea, is one of the biggest and most developed cities in the world with a greater metropolitan population of over 20 million. The home of Gangnam Style, K-pop, Korean cinema, Samsung, and kimchi, South Korea has been making a big splash in international culture. But in many ways it’s a culture that’s always trying to catch up to the West in international trends. Since 2012, one of the faster growing trends here has been craft beer. 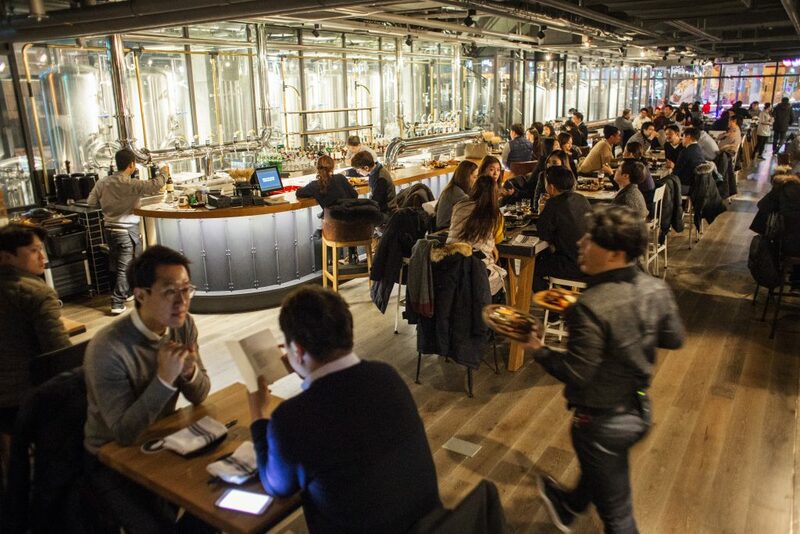 Korea now has about two dozen microbreweries, most of which are less than three years old. The most established of these—like Magpie, The Hand and Malt, Galmegi, and The Booth—have already been experimenting with hop growing, barrel aging, souring, traditional Korean ingredients, and even international collaborations. At the same time there’s a flood of imports, mostly from Europe and the U.S., that continue to bring new tastes to an ever-growing marketplace, including Ballast Point, Brooklyn, Mikkeller, and most recently Goose Island. 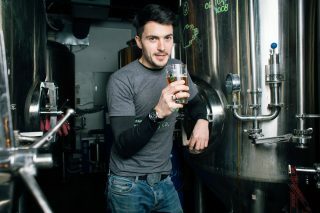 Goose Island just launched a beautiful new brewhouse in Gangnam, Seoul, plucking a talented young expat brewer from Australia, Phillip Lynch, who had previously brewed for Budnamu Brewery on Korea’s East coast. “In some ways it’s a dream job,” Lynch says of his new gig with Goose Island. “I spent six weeks in Chicago [after I was hired]. Basically just day-to-day brewing there. Each week I spent at a different location.” Lynch rotated between the cellar, brewhouse, hop farms, and barrel warehouse. 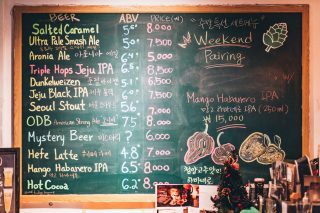 It was a crash course in high-powered brewing, and unlike anything you could see in South Korea. The Goose Island Brewhouse is a beautiful location where you can tell that no expense was spared. There’s a small brewery, a barrel room, multiple floors, a rooftop and an outside terrace, and the building is floor-to-ceiling glass and chrome. Lynch says they wanted to bring the urban Chicago aesthetic. For Seoulites, who are accustomed to cramped basement bars and tiny dining spaces, these expansive rooms, long tables, and high ceilings will make them feel like they’re in the wide open spaces of the Midwest. But it is also “tailored to the way Koreans like to drink and eat,” he explains. “Koreans have a kind of different waiting style than in Chicago. For instance, you don’t have to make eye contact with your server like you would in Chicago.” In Korea, many restaurants have a doorbell-like buzzer at the table that you can push for immediate service. “And you don’t have to tip!” adds Lynch. 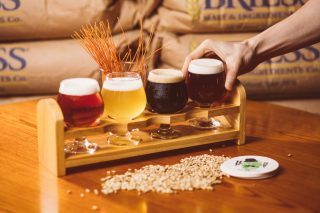 Although he recognizes that working for a major brewing company like Anheuser-Busch InBev (who own Goose Island and countless other beer labels) might rankle some people in the local craft beer scene, it comes with so many benefits. For instance, AB InBev also own one of the two major Korean breweries: Oriental Brewery. 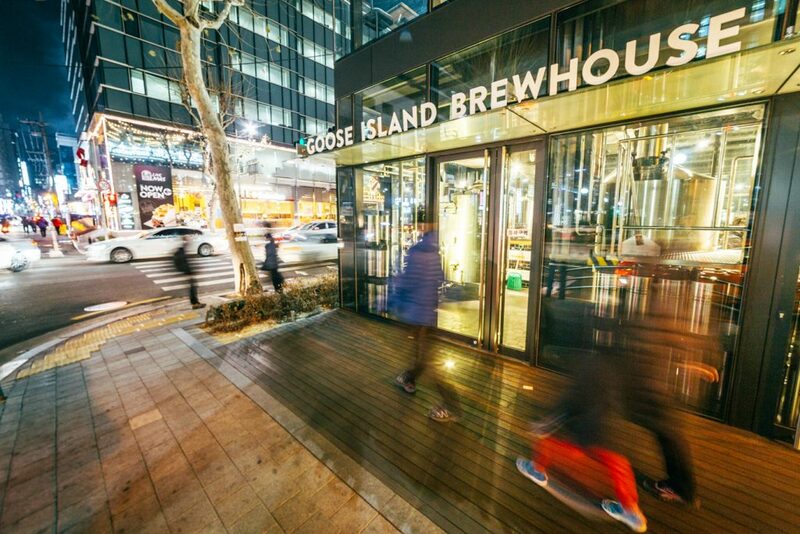 As such, Goose Island has a brother in Korea that has all the infrastructure and regulation knowhow that most other Korean craft breweries lack. A few other breweries and brewpubs here have had a nightmarish experience in getting licensed. Sadly, the government is one of the biggest plotlines of the growing Korean craft brewing scene. “There are much more regulations [in Korea],” says local brewer Troy Zitzelsberger. “And there are much less things you can do freely here. The taxes are way higher over here, and you’re importing basically every ingredient you’re using, so…” You get the picture. Yet, because the scene is so new, and because it’s a Western-inspired industry, expats in Korea have found opportunities they never could have back home. One day, Lynch was sitting at Maloney’s Pub, when in walked a Korean gentleman. “I have money and I want to start a brewery,” he said. A few minutes later another brewing expat named Troy Zitzelsberger walked in. Zitzelsberger, a young actor from Michigan, was Korea’s first cicerone and opened Seoul’s first major tap house, Reilly’s Taphouse. 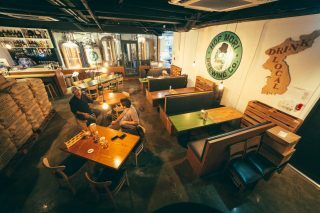 Lynch introduced the two men and, a few months later, they opened HopMori, which brews some of Korea’s best small batch beer. Troy’s flagship beer is Jeju IPA. Jeju is a semi-tropical island off the south coast of Korea and it grows a special variety of orange, the hallabong, which is prominent in the beer. Even with the encroachment of big foreign craft breweries, at the end of the day the soul of any craft beer market needs to be small and local. But for that to happen, it’ll need some help. Curious to learn more about craft beer’s impact around the world? Follow The Growler as we globe-trot in search of craft beer in 7 Continents of Beer.